1Lt Charles F. Hanselmann (P) - Flew all of his missions as First Pilot. Thirty mission combat tour completed on 9 May 1944. 2Lt Lucien B. Calwell (CP) - Flew on 17 missions as CoPilot with 1Lt Hanselmann (72 thru 84, 88, 93 thru 132). Flew on 10 missions as CoPilot with other Pilots (111, 115, 116, 121, 124, 126, 127, 128, 130, 132). Upgraded from CoPilot to Pilot on orders dated 04 April 1944. Flew his last mission (134) on 11 April 1944 as a First Pilot. 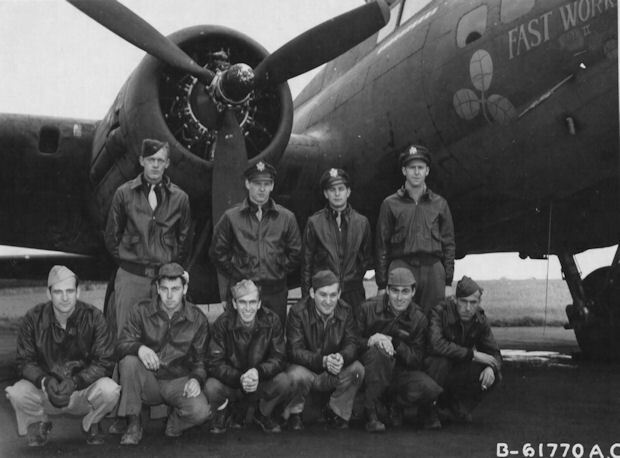 1Lt Elijah W. Ramsey (N) - Flew on 22 missions with 1Lt Hanselmann and 8 missions with other Pilots. Thirty mission combat tour completed on 16 March 1944 (mission 121). S/Sgt Keith N. Armstrong (BTG/WG) - Flew on 28 missions with 1Lt Hanselmann - 11 as BTG and 17 as WG. Flew 2 missions with other Pilots. Thirty mission combat tour completed on 11 May 1944 (Mission 161). S/Sgt Walter S. Williams (WG/BTG) - Flew on 28 missions with 1Lt Hanselmann - 11 as WG and 17 as BTG. Flew 2 missions with other Pilots. Thirty mission combat tour completed on 9 May 1944 (Mission 149). T/Sgt Robert F. Jaouen (WG) - From the Lt Robert L. Cunningham crew. Flew 11 missions with 1Lt Hanselmann after S/Sgt Lambert's last mission. Bailed out over England with the Lt Ambrose G. Grant crew returning from mission 78, 14 October 1943, to Schweinfurt, Germany. S/Sgt Mitchel J. Tybuszewski (TG) - Flew on 27 missions with 1Lt Hanselmann and 3 missions with other Pilots. Thirty mission combat tour completed on 7 May 1944 (Mission 146).